Will and Keith are making precision cuts to form the tenons on these timbers. Will on the left is holding one of the largest saws in our Timber Frame Shop. All of the joinery is cut in the main shop and you can see a lot of saw dust on the floor from the work going on. I always get a bit nervous when these guys work with the big saws. But, they are very skilled and exercise a lot of caution. Will is working with Mr. Mortis which is a rather large milling machine we use to make the deep mortis cuts in timbers. Will is removing the bulk of the wood in the mortis cut which will then be finished by hand using a mallet and chisel. Mr. Mortis is a fast way to produce precision cuts saves us a lot of time. All joinery is finished using the traditional mallet and chisel. This is the way its been done for hundreds of years. Finishing joinery by hand allows us to control tolerances down to 1/32 of an inch. Controlling tolerances at this level ensures tight fitting joints and an attractive finished frame. 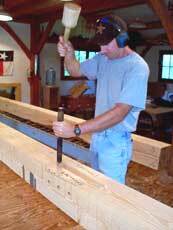 Here Keith is making the final cuts in a deep shoulder joint where a girt will intersect a post. The shoulder joint is particularly strong and is used most often when several girts arrive at one post. You can learn more about the joinery we use in the Galleries section of our Web site. There is always a lot of work going on in the shop and you can see the number of timbers we are working on at the same time. These timbers are called purlins and will be used between roof trusses in a new home in La Grange Texas. Purlins provide additional support for the roof system but are not always necessary depending on the spacing of the trusses. They do add a very attractive look to the home nonetheless. Cutting joinery by mallet and chisel wears out a lot of chisels. 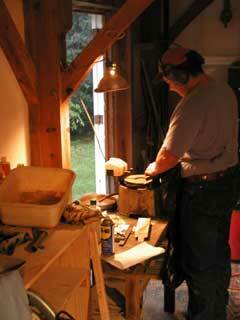 Doug is sharpening his chisel on a grinding and finishing stone. Sharp chisels make clean joints. 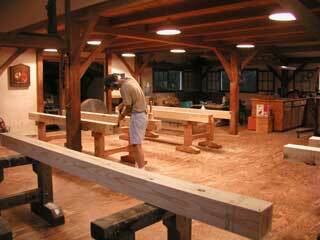 Timber framing is a labor of love as much as a very detailed craft. The crew take a lot of pride in doing quality work and our payoff is when you see your finished frame for the first time.